In 1927, my grandfather Charles T. Boyd was leasing an alfalfa farm located about five miles from the town of Lamar, Colorado. He had decided to quit farming and get back into the meat business by opening a butcher shop in Lamar. He told Papa that he could take over his lease and move in right away, so Papa and Mother decided to leave the wheat farm in Belpre and move to Lamar. The years in Kansas had been difficult, with frequent tornadoes and times of drought, so it seemed like a good move for the family. The move itself was quite an event. Papa drove the livestock, including Billy, to the railroad station in Belpre and put them in a boxcar on a freight train with all of the household goods. He traveled with them on the train to Lamar. After he arrived, it took several days for him to unload the cattle, horses and household items and bring them out to the farm. We children traveled with Mother, who drove our old Ford touring car with its isinglass curtains from Belpre, Kansas all the way through Dodge City to Lamar, Colorado. It was a trip that I will never forget as long as I live. It was winter, and cold. We were all bundled up, and had only heated bricks and baked potatoes to keep our hands and feet warm. It snowed most of the trip, and Mother became very tired. We sang “Over the river and through the woods, to grandmother’s house we go,” etc. The trip took us two days. At the end of the first day, we checked in at the old Dodge House in Dodge City only to find bed bugs in each bed. We finally wound up sleeping in the car. It was a bitter cold night, and we almost froze. There were other experiences, too, that I associate with that trip — seeing jackrabbits all along the way darting across the snow from tumbleweed to tumbleweed, fixing a tire after we ran over a big rock in the road, and crossing the Arkansas River over a very flimsy bridge of wood planks. When we arrived at the farm house two days later, it was cozy and warm. Papa had built a fire in an old potbellied stove and had a pot of hot soup ready for us. He always had the welfare of the family in mind. We were exhausted, but were happy to be in our new home. How my parents managed all the details that had to go into such a move, I’ll never know. As you can tell, it was a move that remains in my memory to this day. The new farm in Colorado was an alfalfa farm with irrigating ditches forming a network across the fields to supply water. We had good drinking water from a well that was lined with waxed walls. It was a small farm in comparison to the one in Kansas, only 80 acres versus 320 acres plus hundreds of acres of cattle range. The alfalfa had to be cut at least twice a year and put up in high stacks. The farm equipment to cut, rake and stack the alfalfa was quite different from what we used at the wheat farm in Kansas. The horse-drawn rakes were very efficient in gathering the crop and putting it in neat rows across the fields. Then it was bunched into small stacks with what was called a “go-devil.” After that, a machine called a stacker was used to put the alfalfa into larger stacks about thirty feet square and twenty feet high. The hay was sold later to the farmers’ grain company in Wiley about five miles away, although some was put in the silo with corn stalks for silage, and was later fed to the cows and pigs through the winter. There is nothing quite like the smell of silage when it ferments at the bottom of the silo. Bad!! Papa was a dedicated farmer. He worked hard, especially during the haying and harvest times. He was gentle with the animals. He never used a whip on the horses, but got them to work together and steadily, which made it possible for him to get the maximum out of their efforts. The farm was several miles out of town across the Arkansas River, which often flooded. At ten years old, I can remember much of the life there as my work became harder. My involvement with the chores increased and so did my experiences with Papa, Mother, Dorothy and Margie. As there were only two years between Margie and myself, we spent a lot of time working and playing together. By this time, I had learned how and was strong enough to harness the big horses. Papa would only have to say what needed to be done and I could now do it by myself. I drove the team of horses hitched to the wagon, manure spreader, mowing machine, rakes or plows. Also, I loved using the “go-devil,” a rig to pick up alfalfa and stack it in the fields. This was lots of fun, and I looked forward to it. I have many memories of my experiences on the Colorado farm, such as working at night when the irrigation water would all of a sudden come through the main gate beside the house. You took the water when it came and had to direct it by a system of smaller ditches and dams. One memory from the Lamar years I call “The Wild Ride,” and I think it deserves to be preserved, as to this day our children ask me to tell them the “Wild Ride” story. Papa had gone down into New Mexico and purchased a pair of roan draft horses. They had to be over 16 hands and weighed a ton. They were sure big to look at especially to a small boy of 10. The day had come when Papa decided that the manure had to be taken from the barn and spread over the alfalfa field. A manure spreader is a large wagon with a system of moving chains in the floor that gradually moves the load of manure from front to back. The faster the horses pull the wagon, the quicker the load will be dispersed. There is also a wheel at the back with metal spikes that spins and spreads the load as it goes. In fact the manure is actually thrown into the air with quite a degree of force. We shoveled manure into the wagon all morning, and finally Papa decided it was full. Any more and the horses might not be able to pull it. This would be a good test for the new team. In fact the fellow who sold the team to Papa said he hadn’t harnessed them yet and they might have to be broken in easy. With a heavy load like this, Papa figured they would go slowly and get used to working together. Although they were sort of nervous, we managed to get them harnessed and hitched to the spreader. I had driven many horses before, so Papa said, “Take the reins, Harold, and start slow. The gate is open so just head out to the field.” Hardly had I picked up the reins and put the spreading lever down but off those two roans went at a gallop. Well, you never saw such a sight in your life. That manure went flying in every direction. It was a little over a quarter mile to the end of the field, but that wagon was unloaded long before we got to the fence. I was pulling on the reins as hard as I could, but it had no effect on the big team and they didn’t stop until their noses hit the barbed wire fence. After quite a spell I gradually turned them around and walked them back where Papa stood. He was laughing his head off and told me that I did a good job with the new team. Over the next year the roans would become very dependable so we could use them for almost any job. Another memory of great fun in Colorado is trapping skunks with Margie. The old seep ditch was the best spot to put the traps. We would tie a rope to the trap, then tie the rope to a long stick so we could pull the trap and skunk out of his hole, up the steep bank of the ditch, and across the fields to the barn. Papa would shoot the skunk, hang it on the wagon tongue, and then we would skin it. The fur was worth about $2.00, and that bought a nice baseball glove. A dream that haunted me for years includes a dead skunk hanging on the tongue of a wagon and blowing in the wind. Of course, I always thought it to be alive and worried for fear it might somehow come after me. I think this dream came from seeing hanging skunks when I was quite little at the farmhouse in Kansas. 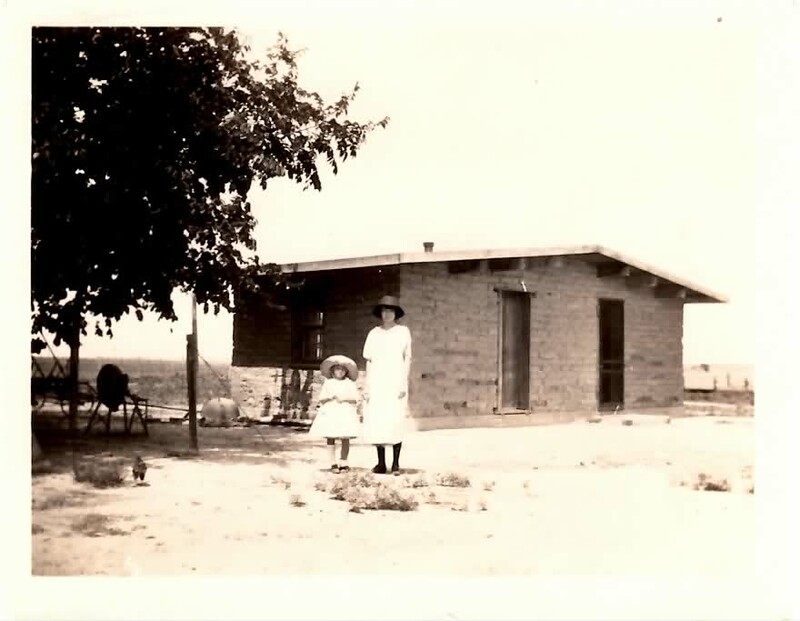 The one-room adobe huts that housed the Mexicans who worked in the beet fields were special playhouses for Margie and me. They weren’t used except once a year, yet they had all the kettles and pans for the workers to use for cooking. The furniture consisted of a small wooden table and broken chairs. Old traps and worn out harnesses hung on the walls. I remember a time when I forgot to take off my Sunday suit before skinning a skunk, and ended up living in one of the adobe huts, with Margie bringing me my meals. We usually rode a school bus into town, but Papa would drive us in our old Ford if for some reason we missed the bus. School in Colorado was a big change, as it was bigger, had more children, and was very strict. It was difficult when I first started going to school in Lamar, as I was still wearing a plaster cast from my ankle to my knee from the injury I got in Belpre falling on the school steps. All I could do was walk with a stiff leg. It would be a month before the cast came off and I could walk normally again. The other students teased me a lot and called me “that Kansas Kid” because I spoke with a Kansas twang. It was at this Lamar school that I first became involved with teacher discipline as a result of my behavior. The school in Lamar was a three-story building, and we had classes on every floor requiring quite a lot of going up and down. Because of the cast, my knee was in a stiff position. Unless I took two steps at a time going up stairs, I couldn’t keep up with the other kids, and I’d be late for class. One of the teachers called me into her office for a good lecture. I remember vividly that her name was Miss Utter. She said that it was strictly forbidden to take two steps at a time and that I would just have to do the best that I could. If I was late to class the room teacher would deal with me as she saw fit. Believe it or not, Miss Utter dyed her hair blue and slicked it straight back with a bun on top. She never smiled and was always finding fault with all of the students. On Monday, my homeroom teacher said that Miss Utter, who was the assistant principal that year, wanted to see me immediately in her office. Down the stairs I went and knocked on her door. “Come in,” she said. As I opened the door I could tell that she was livid, and she shouted for me to sit down. “You are a troublemaker and I’m going to punish you for disobeying the rules about leaving class without permission.” She opened her desk drawer and took out a red rubber hose at least two feet long. I quickly reached into my pocket and put the note that my mother had written in front of her. As she read it, her face got very red. I could tell that she was going to use the hose to slap my hands, and without any hesitation I quickly grabbed the note and ran out the door. I went over to the senior high school and got my sister Marguerite. She called home, and before long Papa was there and we had to face the situation with this terrible teacher. Of course, I had the written permit from Mother in my pocket, dated, etc. Again I was told by Papa that I should have shown the teacher the note ahead of time. Papa and Miss Utter agreed that my punishment was to apologize to the entire class the next morning. At least I felt that my friends liked me because they all got to go to the game early. Eventually, Papa and the other members of the school board decided that Miss Utter should be replaced. After a while she was gone and things were much easier at school after that. As a child in Kansas and also in Colorado, I had good health. As I remember, I had the usual children’s miseries of measles, mumps, chicken pox, whooping cough, stubbed toes, earaches and toothaches, as well as sore throats, flu, colds and the normal cuts and bruises. I also remember cutting my thumb with my jackknife while whittling a whistle out of a small willow branch, and falling out of the haymow in the barn onto some machinery and cutting my leg. There was one time when I got a big “goose egg” on my head after falling off of my pony while roping a fence post. Of course, the rope was tied to my saddle horn. How stupid can one be? These are only a few of the typical incidents that affected my health as an active little boy on a farm. The general treatments for these kinds of problems were iodine and later Mercurochrome for cuts, along with caster oil for a stomachache, and Novocain at times by our dentist. Of course a hot bowl of chicken soup was good medicine for just about anything. During the 1928 winter, I came down with pneumonia. At first, we thought it was just a bad cold. Mother said that I had a temperature and put me to bed. I wasn’t any better the next day, so she called the doctor, who came out to the farm. He told us that I had a bad case of pneumonia and needed lots of rest. As he left, I can remember hearing him in the hallway tell Mother and Father that if I could make it through the night, I would live. Once my fever broke, I’d be on my way to get well. Otherwise, he couldn’t save me. He said, “We’ll know by morning.” I remember quickly repeating my prayers several times before I went to sleep. As it turned out I was much better in the morning as my fever had broken, and I went back to school in a few days. After that experience, I had bad colds and often came near to catching pneumonia again. A few years later, I had my tonsils out, and that seemed to help a great deal. It seems, however, that I have always had trouble with colds, and to this day have to clear my throat quite often. In addition I’ve had problems with my sinuses that seem to be incurable. The three years in Colorado took a lot out of my mother. Her health declined, and in November of 1929, she became quite ill with pneumonia. In those days there were no antibiotics available, so one’s immune system had to take care of fighting off illnesses. The doctor came out to see her, but told my father she had to go into the hospital where they could give her better care. That day my father carried her out to the car, and that would be the last time that I saw my mother alive. My father stayed with her at the hospital that night, but by morning she had passed away. Papa came home and told us three children what had happened and comforted us the best he could by saying that God must have needed her in heaven. We then drove back into town and went to the hospital where we kissed her goodbye. Later we attended the funeral and went to the cemetery where her remains lie to this day. She was buried in Fairlawn Cemetery in Lamar, Colorado, in the same plot with her mother Carrie Boyd and father Charles T. Boyd. I have visited the gravesite where there is a small gravestone. It is under a big maple tree on a hill overlooking a valley below. Mother’s death on November 19, 1929, was a terrible shock to me. I was twelve years old when she died, and the loss was difficult to accept, especially because Mother and I were very close. She had really saved my life the winter before, when I had pneumonia and nearly didn’t make it. After her passing, my life was forever changed. In addition to Mother’s death, Papa had also lost his father and a brother a few months earlier, and this was a turning point in his life at age 41. On top of our personal losses, the Great Depression years began in 1929, after the markets crashed. Following Mother’s death, we moved from the farm into Lamar. Papa had an auction where all the farm machinery and livestock were sold. A representative from the Barnum and Bailey Circus purchased all our horses and ducks. He also bought Billy, my beloved Shetland pony and the joy of my life, for fifty dollars. The rest was sold to neighbors. It was a very sad day when the fat man jumped on Billy and rode off down the drive. Although I had gone into the house so as not to see when they were to take Billy away, I can remember peering out the window just as they left. I knew there was no way we could keep Billy, because we would be living in town, but just the same it broke my heart. I’m not sure how long it had been since Mother had died, but sad things were happening in my young life. Papa said he would save the money from the sale of Billy to buy me a bicycle when we got back to Michigan. He did fulfill his promise and bought me a new Flyer Special. Sadly enough, someone stole it after a couple of weeks. By then I was getting hardened to bad luck. Learning to accept losses and disappointment were lessons that came early in my life. 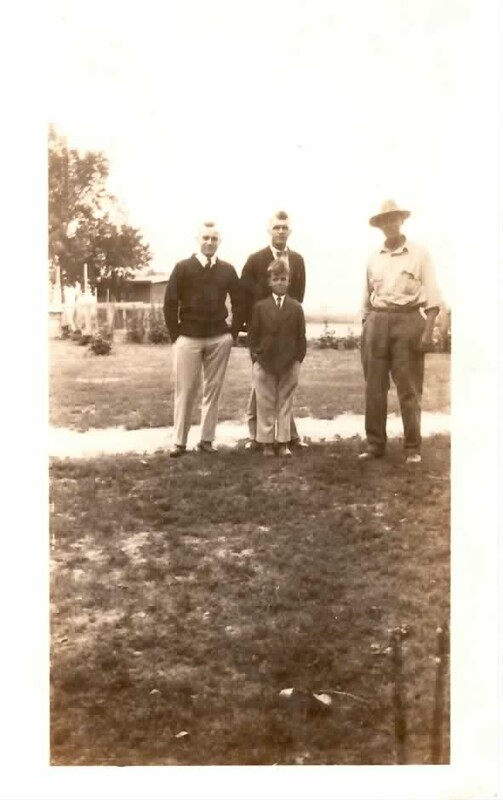 When we left the farm, Papa went into partnership with Grandpa Boyd in a meat market in town, but it went broke after about six months so Papa decided to return to Michigan with us three children. We planned to live in the old Westerman homestead in Adrian where Papa was born. The trip by car from Colorado to Michigan in an old 1925 “Overland” was quite an experience in itself. It’s a wonder that the car held together all the way to Michigan. It was a long and tiring trip, and I can remember having many flat tires along the way. It seemed like we would never get there, and I’m sure we children tested Papa’s patience. One thing I do remember was how we practiced speaking without a Kansas or Colorado nasal twang, like “ca-ow” for cow and “na-ow” for now. Papa tried to help us talk with a more rounded sound. I remember that the school kids in Michigan teased us about the way we spoke, and called me the Kansas Kid. With practice we soon learned to speak much better and the teasing subsided. What a lovely post. I know people who had family in that area around that time, so I was very curious to know what it was like living there, and you painted a vivid picture. I hope it isn’t odd to offer you condolences on the loss of your mother so many years after it happened, but I’ll do that, since those feelings of loss never really go away: My most sincere condolence. Your story is lovely. I am writing a novel, with a chapter about Lamar, where my mother attended teacher’s college in 1927. She was from Eads, Colorado, nearby. She met my father in Lamar where he lived with his mother and sister . They married in 1940 when he went to war. I am looking for details about Lamar. I’m interested in what the town looked like back then, when you lived there. Were the streets paved? What was the population? Do you remember details of the school house you attended? Was there a bustling downtown or building scattered here and there? Anything you can tell me about the weather, or the town, or what people did for fun (silent movies?) would be helpful, and add details to my story. Hi – I wish I could be of help, but the story was written by my Dad before he died. I don’t have any pictures or additional writings. Sorry. Good luck with your novel.